How to Start a Fire, tells a wild, sad, funny story of twenty years in the friendship of three very different women. Thrown together in college, they grow to adulthood united and divided by secrets, lies, and a single night that shaped all of them. When UC Santa Cruz roommates Anna and Kate find passed-out Georgiana Leoni on a lawn one night, they wheel her to their dorm in a shopping cart. Twenty years later, they gather around a campfire on the lawn of a New England mansion. What happens in between—the web of wild adventures, unspoken jealousies, and sudden tragedies that alter the course of their lives—is charted with sharp wit and aching sadness in this meticulously constructed novel. Anna, the de facto leader, is fearless and restless—moving fast to stay one step ahead of her demons. Quirky, contemplative Kate is a natural sidekick but a terrible wingman ("If you go home with him, might I suggest breathing through your mouth"). And then there's George: the most desired woman in any room, and the one most likely to leave with the worst man. 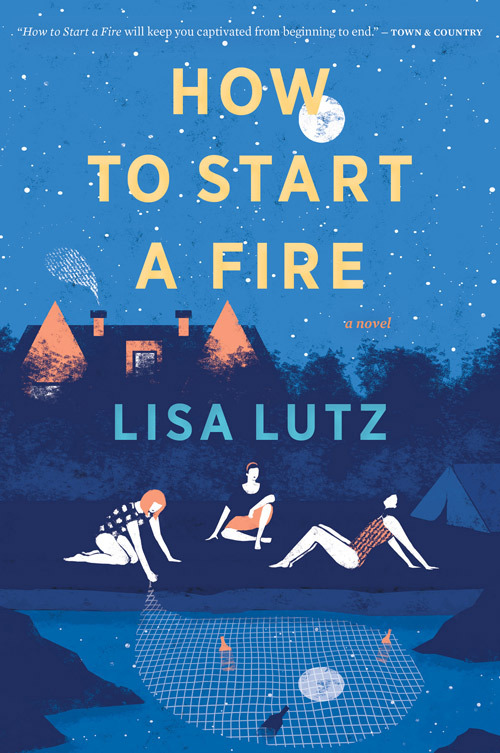 Shot through with the crackling dialogue, irresistible characters, and propulsive narrative drive that make Lutz's books so beloved, How to Start a Fire pulls us deep into Anna, Kate, and George's complicated bond and pays homage to the abiding, irrational love we share with the family we choose.